We all remember as a kid we use to celebrate April fools’ day as a day of pranking, all the pranksters crawled out looking for fresh victims. On this day, people become more cautious of each other as seasoned troublemakers try out innovative pranks. After all, it’s one time of the year when all sorts of mischief are pardoned. You will be shocked o know that April Fools ’has its history and has a lot to with history. It has many origin stories, including a connection with the Holi festival of colours. Before the Gregorian calendar was introduced, the world followed the Julian Calendar of Julius Caesar, which wasn’t in sync with the solar cycle. New Year was celebrated every year on April 1 according to the old calendar, which was shifted to January 1 after the Gregorian calendar replaced it. But it wasn’t easy for people accept from the old to the new and often forgot that the New Year had been shifted to January. The forgetful ones who celebrated New Year on April 1 were mocked on the day and had paper fish stuck on their backs, indicating that they were fools or “easily hooked.”Many sent out mock presents to each other and spread hoaxes on the day. Another theory is that April Fools’ Day is celebrated to commemorate one of the most devious acts of the Romans. According to the book Popular Antiquities of Great Britain, many historians believe it was the Romans who should be credited with the start of April Fool’s Day. The Roman men who wanted to get married approached the neighbouring province of Sabines to look for alliances. But the women were not too keen to move to Rome and rejected the proposal. So the Romans thought of a trick. They started a mock festival in honour of Neptune, the Roman of the sea. The “festival” comprised games, which attracted the attention of the neighbouring kingdoms. When people arrived to attend the festival, the Romans kidnapped their daughters and forced them to come to Rome. This mock festival was celebrated on April 1. According to a report some historians believe that the roots of April Fools’ Day lay in Hilaria (an ancient Roman festival). Usually celebrated towards the end of March, the festival involves fooling people by wearing disguises. It is believed that the festival of Holi and Hilaria may be related, as both involve merry-making and pranking. So April Fools’ could have an ancient connection with the festival of colours and we have also heard people saying Don’t take offence; it’s Holi! (Bura na mano; Holi Hain) after pulling a prank on someone on the day of Holi. Another theory is that April Fools’ Day is that End of March and beginning of April marks the advent of spring and the changing seasons. 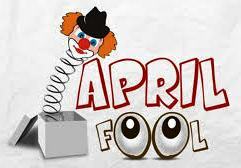 It is believed that April Fools’ Day was started to commemorate the surprises the season brings. All these stories seems convincing. But there is no full proof. Whatever be the origin of April Fools’, is a day of having fun. So if you have been pranked don’t be disappointed and just enjoy the flavour of the month.